Jacinta runs a number of workshops and is recognized as an entertaining and inspirational trainer. 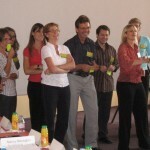 Workshops tend to be for one day depending on the course content. Participants receive an individual coaching session after the workshop which helps to consolidate the workshop material and encourages participants to implement the workshop outcomes.